Set sail in this amazing electric-powered submarine and prepare yourself for the adventure of a lifetime. 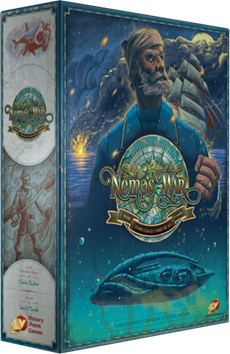 With this supercharged second edition of Nemo's War you will travel across the seas on missions of science, exploration, anti-Imperialism, and War. The game is now available both on PC and Mobile versions of Tabletopia! Nemo’s War is based on the novel "20,000 Leagues Under the Seas" by Jules Verne. It’s a single-player game of underwater exploration and combat circa 1870. You are Captain Nemo, commander of the Nautilus. You will search the oceans, fight vessels of all nations, brave the hazards of the seas, find mysterious treasures, behold and chronicle amazing wonders, and travel around the world in your quest for knowledge and vengeance.